Our performance are a programme of two halves. The first half is a selection of wide-ranging songs, arias and ensembles from a variety of musical worlds – classical, theatre, folk, jazz and more – all brought together under a particular theme. 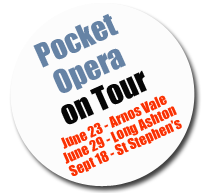 The second half features the Pocket Opera itself. We imagine (or did it really happen?) an opera which a leading composer (or maybe a group of composers) once wrote, but which never got performed. The arias, duets and choruses ended up in other – now well-known – operas. Our job is to reconstruct that original opera… often with hilarious consequences.